Hello everyone! I am so glad to be back and writing this post. It’s been a long time since I shared a recipe. Two weeks ago, my laptop was damaged and every effort to retrieve my files, including recipe drafts and photos didn’t help. My one year old daughter had fun pouring her chocolate drink all over the keyboard while I was napping. I know I should have paid more attention not leaving my computer unattended and I should do file backup more often. I felt very bad about the incident especially losing photo files of family and the memories attached to them. But I learned my lesson and now hoping that the same incident won’t be repeated. Since I lost all the drafts I have written for the recipes I was planning to post as well as the pictures, I had to redo cooking them and writing everything again. 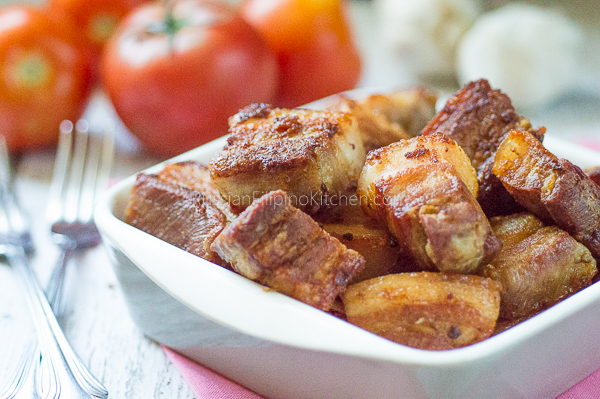 So here’s one recipe that I know many “Bisaya” love–rendered pork belly, otherwise known as pinakupsan. 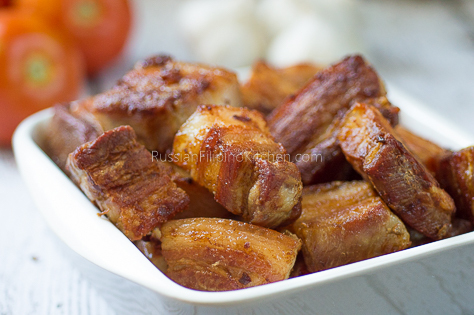 Pinakupsan is a Visayan dish of sliced pork belly cut into smaller pieces and cooked over low heat. 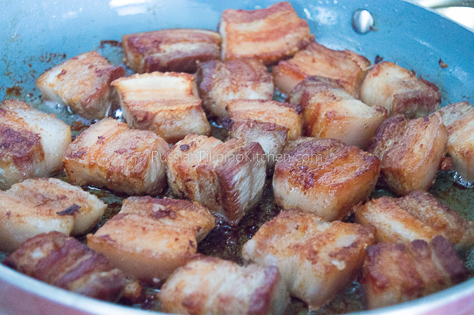 This slow cooking allows the fat to melt down and separate from the meat, leaving a shrunken, crispy pork slices similar to chicharon. The term “pinakupsan” is derived from the Cebuano word “kupos” which translates to “shrink”. There are different variations in making pinakupsan, from the size of the cut pieces to the spices added. 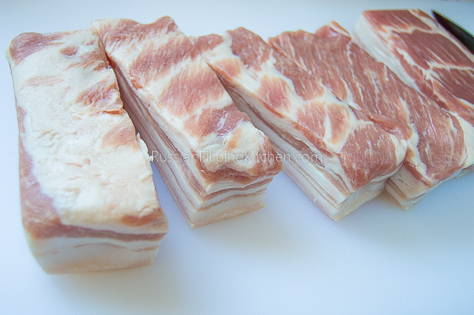 But I will stick to way my mother makes them by simply cutting the pork belly into cubes and using a little salt to season. I have good memories during fiesta celebration in the Philippines when my family cut up a whole pig and Mama made delicious dishes from every part of the hog. 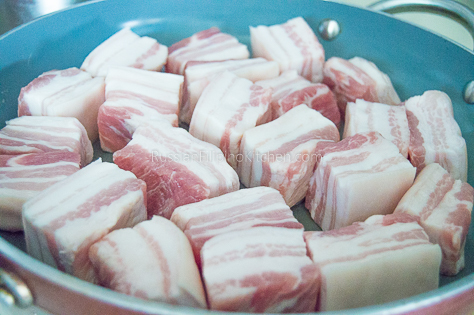 As a child, I was mesmerized watching a grown-up stir a huge kawa (wok) halfway filled with large cubes of pork belly slowly cooked in it’s own fat. We have to keep distant though as the oil splatters every now and then. Hot, boiling lard is an absolute danger! As soon as the pinakupsan is finished cooking, some of them are turned into humba, and the rest are stored in an airtight container and stashed away in a cool, dry place for future use. They are great for any sauteed vegetable dish that calls for meat or can be re-fried to crisp them up further and then enjoyed with a spicy vinegar dip. Yum, yum! 1. 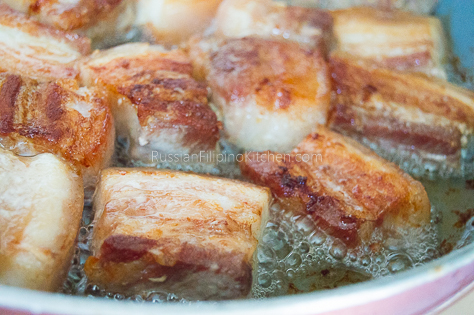 Rinse slab of pork belly under cold, running water, then pat dry with paper towel. 2. 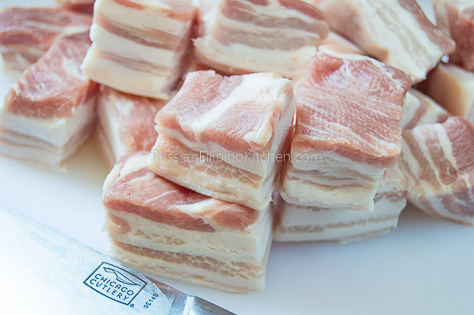 Slice into 1 1/2 inch cubes. 3. 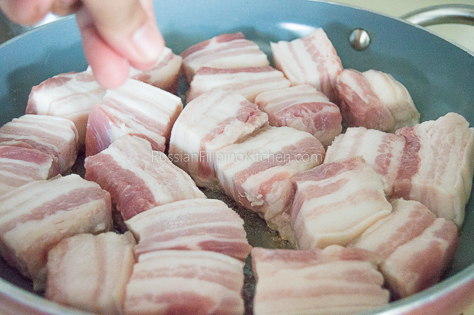 Arrange pork slices side down on a wide skillet and sprinkle with 1/4 teaspoon salt. 4. Turn stove on high and cover. As soon as the meat starts to sizzle and the fat starts to come out, turn down heat to low, and put the cover back on. 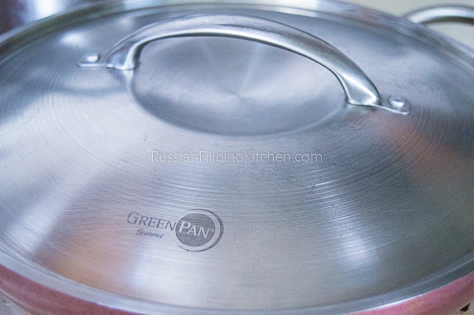 Covering the pan is optional, but I personally do it to brown the meat faster as the heat is trapped when you put the lid on. It’s also great for avoiding oil splatter. If you don’t wish to cover the pan, use a splatter guard or wear protective clothing and be extra careful when you’re close to the stove. In my experience, cooking on low heat significantly reduces oil splattering. Another tip is to keep pouring the melted fat into a heat-resistant container so if the meat pops while frying, there is less oil to splatter. 5. As soon as the meat is browned on one side (about 20 minutes), use a kitchen tong or spatula to flip the slices. Sprinkle with the remaining 1/4 teaspoon salt. Cover and continue cooking. 6. 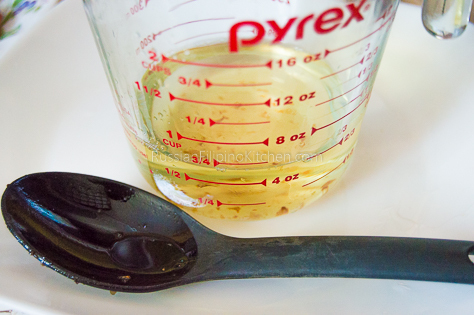 Scoop the oil from the pan and transfer to a heat-proof container such as a Pyrex cup. 7. Continue rendering the fat until the meat has shrunk further and has browned on all sides. 8. 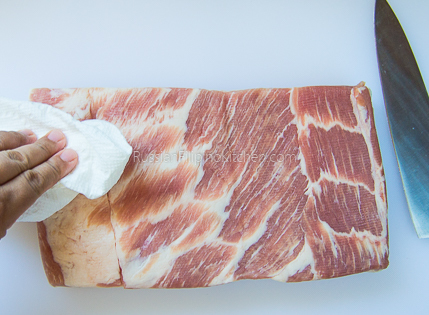 Remove from heat and drain pork slices on paper towels. 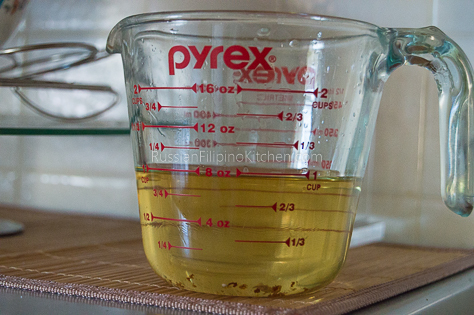 Pour the rest of the oil into the container and allow to cool. Strain and place in a glass jar with a tight lid and store in the fridge for later use. 9. 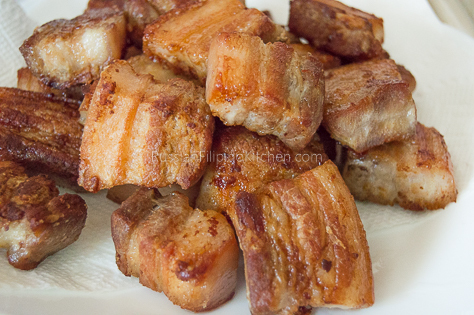 Serve the “pinakupsan” chicharon-style with dipping sauce or store in a zip top bag or sealed container for use in cooking later on. You got me at pork belly! 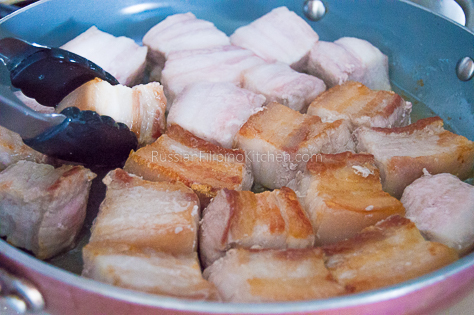 Cant wait to try this, seem much easier and less work than traditional lechon kawali. And I can just imagine the many ways I can use pinakupsan…binagoongan is first on the list! I am loving the pictures, too. Thanks, Ms. Lalaine! I usually make a huge batch and just store them in the fridge till ready to use.